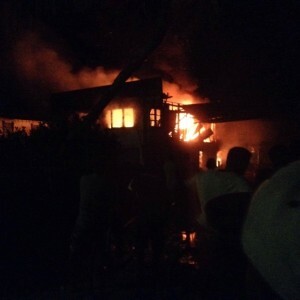 Two prominent rice farmers in Region Three were Sunday night burnt to death in their house during an attack by bandits. Dead are Munair and Jamila (only names known) , said to be elderly persons. One of the theories is that after the elderly couple realised that bandits had invaded their home at Good Hope, East Bank Essequibo, they locked themselves in their bedroom. It is believed that the bandits set fire to the wooden and concrete house after they failed to gain entry to a bedroom where the husband and wife had locked themselves in. Investigators believed that the robbers might have clipped a grill and gained entry to the house. Police and fire fighters were summoned to the scene after the fire began. Eyewitnesses said the Munair was heard yelling through his grilled window as neighbours drove out the tractors from his yard while the fire raged.